Multi-Function, Panel PCs, Smart Displays are LCD displays incorporating processing power beyond that required to support the display of incoming video alone. NLS offers three styles of Smart Displays: Panel PCs (PPCs) which are LCDS with integrated single board computers running under Windows or Linux operating systems, Multi-Function Displays (MFDs) which feature programmable bezel buttons operating under proprietary MCU/firmware control, and Backplane Workstations designed around a plug-in backplane architecture permitting great flexibility for incorporating different computers and other boards. Standard features include a Hard Drive, DVD Read/Write ROM, SATA, USB and RS-232 Ports. A 15″ XGA LCD panel with armored resistive touchscreen is standard but other LCD panels and touchscreen options are available including Full HD. Unlike typical Panel PCs designed around a deeply embedded single board computer, NLS Military PPC models, like our PM-8 CF-8-NP1, incorporate a Backplane Architecture: VITA-74 or similar. The great majority of PPC failures involve the power supply and/or other peripherals, not the CPU. The architecture of typical PPCs requires the entire unit to be returned to the factory for repair of any failure, often a lengthy and inconvenient process, as the unit is must be removed from action. In contrast, the NLS PPC can be repaired in the time it takes to unplug and remove the SBC module, which includes the OS, application software and data, and transfer it to a new housing. All Secure Information is easily removed for protection and/or transferal to another operational platform. The backplane design architecture of the PM-8 CF-8-NP1 can easily be incorporated into larger LCDs to convert a standard display into a powerful engine that can perform internal processing and encode/decode H.264 MPEG-4 video and perform internal processing and other high level operations without the need for a separate computer, saving space, power and cost. Our PM-10.4-MFD can be ordered with a number of different video input configurations, custom bezel button signage and output data sequences and other options. Our PM-10.4-MFD can be ordered with a number of different video input configurations, custom bezel button signage and output data sequences and other options. 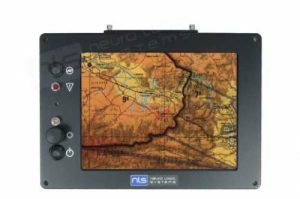 The NLS PM-10.4-MFD represents a technological advancement of MFD technology featuring an MCU controlled Dual-Mode Hi-Brite/NVIS backlight system to ensure optimal viewing under all cockpit lighting conditions from glaring sunlight down to night-time brightness levels compatible with NVG use. The PM-10.4-MFD is designed for installation in both Portrait and Landscape orientations. Powerful internal video rotation circuitry ensures that the images are always displayed in proper orientation. The PM-10.4-MFD can be ordered with a number of different video input configurations, custom bezel button signage, output data sequences, and other options. The RW-15 has been in deployment on USN air bases and aircraft carriers since 2008 where it is used in the service of flight actuator mechanisms on F-16 and F-18 fighter jets. CF-8-NP1 controls the power generator in the US Army Universal Ground Control Station. The PM-10.4-MFD is deployed in the cockpit of C-130J aircraft for monitoring live video streams from external cameras. The CF-10-MT is deployed in vehicles in mining, emergency and municipal services, transportation and other industries in harsh outdoor working conditions. The electrical generator system for powering the Universal Ground Control Station required a Smart Display running the generator manufacturer’s proprietary software application. The Smart Display had to conform to specific physical outer dimensions and fit into a pre-existing mounting space in the UGCS. NLS modified an existing 10.4” COTS touchscreen display to conform to the prescribed physical outline dimensions. We changed the 10.4” LCD panel to an industrial grade 8.4” LCD to free up space to add front panel controls and LED indicators. Working in conjunction with the computer manufacturer, we designed a backplane breakout board for routing the various I/O, video and power signals from the computer to the appropriate destinations inside the display housing. A key feature of the design was that in the event of a hardware failure, the whole computer can be quickly removed from the display system in the field and the failed component can be quickly replaced using spares, and put back on-line without the need to remove the whole PPC unit from a possibly secure area.